The hard stereo left and right guitar intro of “Human claim” get right to the point of showing you what DORMANTH and “IX Sins” is about; Crushing Death Metal riffs with deep rumbling gutturals with a layers of harmonious lead guitar melodies cutting through the middle in a melodic Spanish Death / Doom assault. 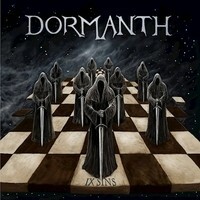 “Human Claim” makes a bold first statement, showcasing a good range of DORMANTH's ability, with heavy, groovy riffing and intricate guitar work both in play in equal measure at different points throughout. It also shows a bit of dynamic flair with the decision to go to clean guitars in the middle and child’s vocals layered vocals over Oscar del Val's rumbling pronouncements. After “Lamb Or Wolf'”'s big intro comes a strong build up using heavy use of panning before exploding into a brilliantly stomping riff with pace and heaviness, complimented perfectly by the pummeling drums. The verse vocals, I feel, do seem to float onto of such an arrangement and stand out as not being up to the same level as the instrumental. This changes in the chorus as it opens up to a huge chorus with the vocals perfectly fitting the urgent yet expansive guitar texture. There is a couple of other nice touches in the song, including plenty more killer riffing, a well-executed guitar solo, a subtle but superb layer of clean guitars to add texture to throw next verse and a tight and impactful ending. “Let See The Wood” continues the assault of heavy staccato chugging, driven forwards by a punchy and present snare drum, but also shows a bit more variation in the vocal style with some anguished high screams. The momentum of the song is carried forward well until it hits a breakdown that kicks down the pace before exploding into a dense and epic chord progression with soaring lead work before the end. The prevalent melodic work on “Like Ice” Takes more presidency than a fairly simple in comparison guitar rhythm, but this is a very welcome change that manages to add more variety to DORMANTH's sound whilst still having the unstoppable power that they create. You can also hear more vocal experimentation crop up towards the end of the tune, which shows they aren't afraid to try things when it comes to putting parts in their songs. The epic guitar lines interspersed with faster sections creates a great variance of energy and tone On the next song, “Promised Land”. It charges forwards from breakneck tremolo melodies propelled by Victor Franquelo's hammering drums into powerful epic choruses and dual lead guitar work from Javi Prieto and del Val. The slower start of “Soul Shall Die” gives way from the brutal straightforward force of earlier tracks into powerful emotive melodies and vocal layers giving it a distinctively epic feeling, that sits very well on the album, and terminates with a suitably fitting solo into a cathartic yet eerie clean guitar outro. A well put together and executed song, “Soul Shall Die” does well to showcase the range of DORMANTH's songwriting capability. The pounding drums of “Misery”'s intro give a hint to the explosive drum work later in the song, before it kicks off to marching huge marching triplet riff that stay's around for a good portion of the song, but is good enough and has the right amount of simplicity and interest to be welcome to it. The heaviness continues with more weight guitar work and firing into machine-gun double kicks and a descending guitar melody that layer up the thickness of the song in a way that still remains interesting with only a few component parts and closes out the song to an abrupt ending. “The Skin” Picks up the speed and energy with some speedy drum work intertwining with guitar arpeggios and chords that build up the bulk of the song between well placed breaks and pauses between sections. It takes a gratifying downturn with some groovy bass and ride interplay in the middle section, before going off again blistering guitar and drum work and concluding with an open section of almost chant like vocals. On the album closer “Sands Of Frozen Tears” harmonized guitar lead continues throughout the song, playing different parts pretty much all the way through and much as on “Like Ice” it's a healthy mix of heavy chord progression and rhythm work with lead melodies guiding you through the middle. The songs have a pretty epic mood to it and is uplifting and majestic, a good choice for the last song aside from one part. The ending is far too abrupt and unexpected, it doesn't seem to fit with the tone of this song, and especially since it's the last part of the entire album I think they could have gone with a much better option than an abrupt stop. “IX Sins” is in overall a pretty strong album, it has coherent and refreshing songwriting with enough variety to maintain interest but with a consistent style tying the whole thing together. The guitar work is tasteful and complements the composition and never pokes out as showing off or unnecessary. It has well thought out harmonies, Interesting changes, and some more unorthodox sections that for the most part are good additions. Whilst the vocal technique is done very well and has a unique tone, I think there could have been more variety. There are also points where they do not make the right amount of impact and feel like they do not fit with the instrumentation as well as they could. Whilst this is only a minor thing and not exactly noticeable, there are other points where the vocals work beautifully. I think whilst the child's voice was an intriguing thing to use on a couple of the tracks, it did get to the point where it appeared too often so it lost the impact of having it and becomes gimmickier. The overall sound of the album is rather good, the guitars are wide and thick, the drums cut through in all the right places and carry the momentum, there's an audible and noticeable, yet not overpowering, layer of bass holding the lows down and the vocals sit clear on top of them all. All together it makes a good balance, with each instrument occupying just the right amount of space. Also the heavy use of stereo panning was quite well utilized for the most part, but at times felt as though it wasn't needed or was too extreme or jarring.